Paul, the welder arrived in his van just after 8:40am this morning. Andy had mentioned to us yesterday that he would either arrive today or on Monday. His job was to fix the hole in the bow diesel tank filler tube. To do this he needed to cut a hole through the hull above the top rubbing strake. 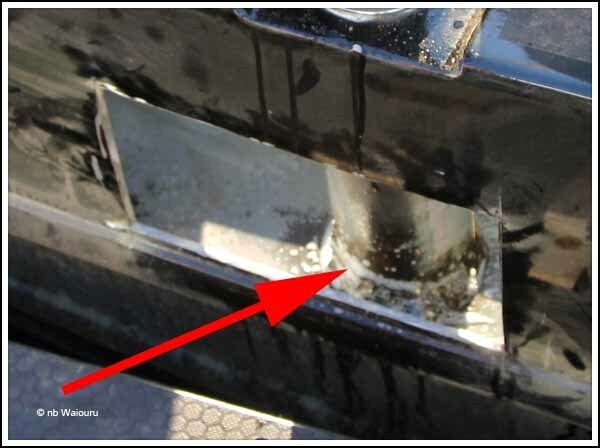 Once the rectangular hole had been cut Paul was able to gain access to the rear of the diesel filling tube. Four pin sized holes were found and filled with weld. The tank was then pressure tested. Nick suggested we screw a grill over the hole (he was joking of course). Paul and Nick then set about welding the plate back into the hole so it was flush. Nick then gave both sides a coat of primer. Paul has done a very good job of producing a smooth surface. There are a small number of imperfections which will be left for Darren to fix when he repaints the area. In the afternoon Nick fitted the galvanic isolator which had been delivered by Aquafax yesterday. It has been mounted inside the stern electrical cabinet adjacent to the 240v shore power two-way switch. The earth lead from the shore power connects on one side and goes to the earth terminal in the consumer unit on the other. A second cable on the consumer unit side goes into the engine compartment and is bolted to the engine mounting frame. The meter is registering firmly in the green so Waiouru appears to be protected. So why fit a galvanic isolator? EU regulations require new boats to connect the shoreline earth to the hull of the boat. This ensures the RCB (earth leakage breaker) will trip and cut the 240v supply to the boat if a fault occurs. However by connecting the shoreline earth to the hull you’re also connecting the hull to any surrounding earthed metal (including mooring posts, and other boats in the vicinity. 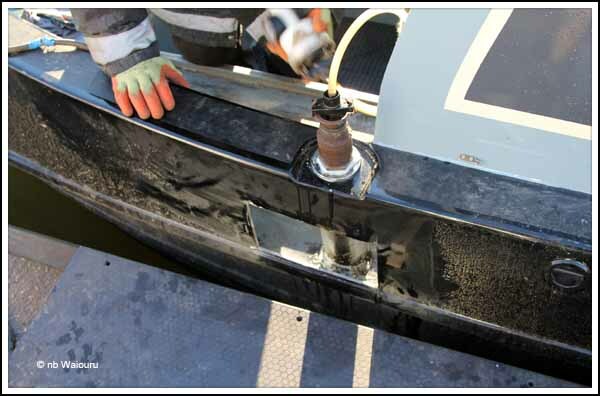 Electrolytic action can take place which may slowly dissolve the steel hull and/or anodes on your boat. 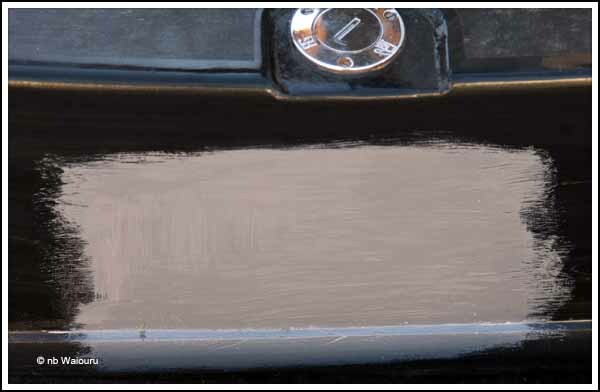 Moreover, if your boat has anodes and other boats don’t then your anodes are protecting all the boats and will obviously dissolve faster. 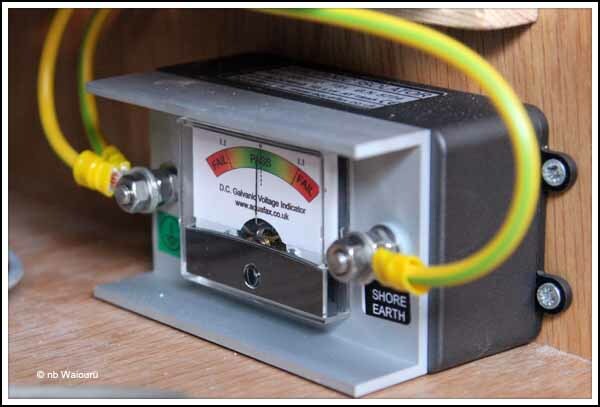 The galvanic isolator ensures your boat is correctly connected and protected but prevents other “stray” currents coming up the earth line and damaging the boat. Obviously you don’t really need a galvanic isolator if your boat is rarely connected to a 240v shore supply. As we intend to continuously cruise it’s likely we will only use shore power on an infrequent basis. However the protection is there for any future owners. Pity about the extreme measures to rectify the holes in the fuel tube but good to hear the to do list is almost completed. We hope you both have a really lovely Christmas which promised to be toasty warm judging your test results. "I can't believe you actually wrote that last sentence Tom! The mere thought of someone else owning Waiouru is unthinkable." I'm pretty sure Tom was thinking of me when he wrote that. He promised I could have Waiouru, and that they only wanted to cruise around a bit, just to iron out any problems, before finally handing her over to me. I said to Jan "Not the face...Not the face!!" Ian ... Stand and be identified you rogue!